Brand: CK Products 42-104 Units: 4 fl. oz. bottle Clear imitation vanilla. Add vanilla flavoring to your baking recipes for an enhanced vanilla taste. Use in cookies, cakes, pastries, and more. Artificial. Sugar-free. 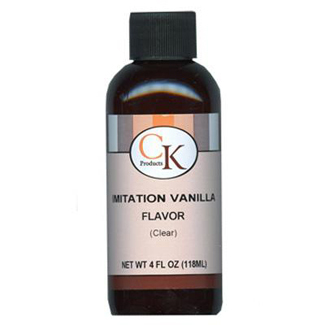 Clear imitation vanilla. Add vanilla flavoring to your baking recipes for an enhanced vanilla taste. Use in cookies, cakes, pastries, and more. Artificial. Sugar-free. Ingredients: Propylene Glycol, Water, Ethyl Vanillin Dihydrocoumarin.